Yesterday, after watching the testimony of Neel Kash-n-Kari give testimony on the Treasury Department bailout of the financial sector, I sent out an email to see if anybody was hearing what I was hearing - which is that the Treasury Department decided to do something entirely different than what they told Congress they were going to do when they asked for the bailout money. Rather than buying up the securitized subprime mortgages so that the terms could be renegotiated, the Treasury Department is using the money to establish a permanent market for the subprime loans. It isn't clear whether the taxpayers will continue to buy the securities or whether they will just use the taxpayers to back the market. Either way, in the words of Dennis Kucinich, "this is a classic bait and switch" on the Congress and the taxpayers. The Treasury obtained the $700 billion authorization from Congress for one purpose - but they are using the money for another. But that isn't the worst of it. I realized the financing for the subprime loans is part of a much larger scheme to "transform" the United States. This is a complex scheme so I'm going to try and explain it step by step beginning with the loans for development and "affordable housing". Below, are excerpts from the now defunct Community Reinvestment Fund (CRF) website. The CRF was the organization that was the demon seed so to speak. It's where the problem started outside of Washington DC. The CRF was started by a man named Frank Altman and it was located in Minnesota. Altman must have been well connected to set up this scheme because he found a way using the secondary financing market to finance "community development". Community Reinvestment Fund, USA is a nonprofit organization that works to provide capital to low- to moderate income communities across the United States. CRF pioneered techniques that bring the resources of Wall Street to meet the needs of Main Street. It does so primarily by operating what is known as a secondary market for economic development loans, as well as loans for affordable housing and community facilities. A secondary market is a financial system by which the right to collect repayments is sold from one group to another. The most familiar example of this is the secondary market for home mortgages. Fannie Mae, Freddie Mac and other groups buy mortgages from lenders shortly after the loans are made. By so doing, they allow the lender to collect virtually all of the repayment owed right away, instead of waiting years for repayment. That allows the lender to offer more loans to others who wish to buy homes. Right here, you need to stop and think about mortgages and business loans and the duration of those loans - typically 30 years for homes and 10-15 for business. There is a significant timing problem that as I see it - is a pyramid scheme and I think their solution to it was to issue the adjustable mortgages on the assumption that the refinancing of those loans would provide the liquidity needed to keep the pyramid going. Because of the way the amount of money available for loans is determined (based on daily deposits), the thrashing of loans - and repayments (from the secondary market) in short timeframes allowed them to multiply the amount of money available for lending so they set up a system for a firehose flow of lending with dripping faucet on the repayment. You'd have to have a liquidity problem at some point - and if I can figure that out, you can bet that the "geniuses" on Wall Street knew it so this scheme has to be considered as racketeering at a minimum but as you'll soon see, the charges would be even more than that. 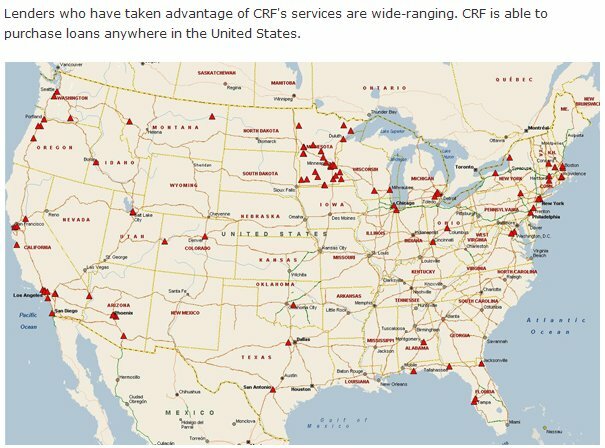 "CRF initially focused on its home state of Minnesota, literally traveling town to town in an effort to line up organizations who would consider selling loans. Because no one had ever heard of such an approach for economic development previously, many were skeptical of the idea. But a few "early adopters" understood the benefit and CRF executed its first transaction in 1989. Since then, CRF has become a national player in the field of economic development as well as affordable housing. But the organization remains true to its initial concept - finding innovative ways of channeling capital to communities in need. Who can sell loans to CRF? Community Reinvestment Fund buys loans from organizations that are in the business of financing community development. Typically, these are nonprofit groups, government agencies and some for-profit organizations. To qualify for our services, the lenders must provide assistance to low income people or communities. We require all of those who sell us loans to sign a legal document that requires that the money they receive for the loans is relent for socially beneficial purposes. This is not an imposition on those who typically do business with us - they would have done the same thing with the money anyway. But it does prevent us from buying from a lender who has no intention of making other socially beneficial loans. Our mission as a nonprofit is to support socially beneficial lending and this method helps us maintain that posture. Sounds nice doesn't it? But there is another side to this community development that doesn't really have to do with money. It does have to do with freedom. But I'll get to that in a minute. There are "social investors" for this scheme - Foundations and corporations who donate to Community Development. A "program related investment" means a social agenda item that the government, Foundation or corporation is buying. It is a manipulation of you, your family and your community for a stealth purpose. But I'll get back to that in a minute. Fannie Mae Foundation, Washington, D.C. So what would be the incentive for businesses to participate? How about a big tax credit? So, as I read this, the taxpayers were already picking up 30% of the cost just through tax credits - and that's before the bailout. And - this is just a thought, what would be the limiting factor on the amount of tax credits CDF could issue besides their honor? Again, timing and logistics are on the side of the schemers. The New Markets Tax Credits (NMTC) program is aimed at stimulating private investment in low-income communities – a first of its kind tax credit to investors who make qualified equity investments in privately managed investment vehicles. By making an equity investment in an eligible “community development entity” (CDE), investors can receive tax credits worth more than 30 percent of the amount invested. The NMTC is part of the Community Renewal Tax Relief Act, a bipartisan initiative signed into law on December 21, 2000, and has been very well received by investors. Altman also did a presentation to the Federal Reserve Bank in Syracuse, New York in 2003. Reuters - "Chinese Government is Top Foreign Holder of Fannie Mae and Freddie Mac Bonds"
But the Intermodal Commerce zones are just one piece of a strategic plan - a Blueprint for a planned, economy and a tightly managed system of control. The Blueprint is a full-blown strategic plan for enslavement - in a very real way. There are many components of it which - just to name a few, includes the elimination of private property, surveillance systems embedded into the infrastructure, moving to a "low-energy" economy which really means restricting your mobility and economic control - which means restricting your capacity to produce and use your talents and skills for what you want to do as a free person rather than what the "community" wants you to do, etc. Private property is being eliminated through regionalization and zoning for "social purpose". In the above literature on Community Development, the "social investors" contributed to "program related investment". One example of a "program related investment" would be getting local community leaders to have their area declared a National Heritage Area - in exchange for the promise of building a Visitor's Center and making the site a "tourist destination". Unmentioned in glossy brochures on the benefits of being a Heritage Area is that the property of the people residing within the Heritage Area lose the right to use their property the way they see fit. They become subject to the "rules" of the Heritage Area board/council/commission. And the above is only one of the ways this community development scheme is designed to deprive you, your family and your community of freedom. Regionalism is a strategy for reducing the power of elected officials by aggregating the power to govern at a higher level across legal jurisdictional boundaries with power in the hands of unelected "soviets". "Soviet" is the Russian word for council. In the communist system, governing is done by unelected councils which we call boards, councils or commissions. What you call them doesn't really matter. What matters is the organization, the power and the implementation of an agenda hidden from public view and making puppets of elected officials as they lose power. There is more to "education reform" than meets the eye. The "reform" is designed to transform the schools into a supply chain for the workforce with cradle-to-grave management of the 'human assets'. Children will have to choose their careers as early as the 6th grade and the "education" is conditioning for worker servitude with limited academic education to ensure permanent indenture. The system includes "career training" in elementary and secondary schools with "certificates" issued for satisfactory completion of training. A certificate becomes in effect, an official sanction to work. With a system of mandatory certificates which is on the horizon, the state then controls a person's economic fate which by definition is a powerful control mechanism for behavior. Another element of education "reform" is the indoctrination to environmentalism using the same "Duck and Cover" strategy of fear on young people that was used on my generation in the 1950's with the specter of the mushroom cloud. Because the schools are becoming the farms for the human assets and that requires significant psychological and social conditioning, the Blueprint includes providing "health care" - including "mental health" care through the schools. Of course all the glossies describe the program as caring for the children but it really is a takeover of children by the state. Programs for the evaluation of children for mental health issues including the drugging of children (the resistors) is integral to the overall plan for control. It should be obvious to all - now that our economy is collapsing and unemployment levels that are officially admitted are close to the levels during the Great Depression, that 'free trade' has been used to gut our economy of it's productive capacity. It's a no-brainer that with unlimited imports from low wage countries with slave labor workforces such as they have in China, that American producers would not be able to compete. The flooding of our markets with cheap imports has driven producers offshore. But the flooding of our markets is not limited to products. The inclusion of 'free trade in services' in the trade agreements has caused our labor markets to be flooded with foreign imports as well. This serves several purposes for the Blueprint planners - first, it economically disempowers the American middle class. It replaces the American middle class - and hence the power of the middle class with foreigners who have a vested interest in maintaining their newly obtained economic and political power. It is in effect, reverse colonization - subjugating the American people to foreigners on our own soil. The above descriptions are just the barest glimpse of the Blueprint Strategy and the transformation of the United States to the communist system of control. The $700 billion bailout and the permanent system of funding of this "community development" agenda is the insult to injury - Americans paying for their own enslavement.